We're in Round 6 of the League with no clear leader in sight. 'Blunderwhelming', 'All You Need is Luft' and 'Team 777' are joint leaders, just separated by tiebreaks. LoneWolf Season 11 is due to start soon, please look out for #announcements for more updates. 1. Scheduling draws are awarded when players show _reasonable effort_ at scheduling. This is demonstrated by offering 3 times across 2 days. 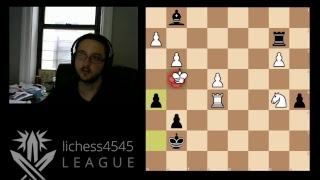 See https://www.lichess4545.com/team4545/season/12/document/rules/#IV.Scheduling. >Player A offers 3 times during the week and says they can't play on the weekend. Player B then says, "Sorry I can only play on the weekends. I guess lets call a scheduling draw" The players contact the mods to claim a draw. This would *NOT* be ruled a scheduling draw following the letter of the rule. Read the rules carefully folks. >If you are player B a much better reply would be "Sorry I can't do any of those times during the week. I can only offer to play Saturday at 11:00-14:00 UTC and Sunday 12:00 -17:00 UTC." In this instance we WOULD be able to rule a scheduling draw. Also, if you can only play 2 days of the week, maybe its best to set yourself unavailable so an alt can try to schedule a game. I know it seems a bit artificial when someone tells you they can't play on the weekend to offer times over the weekend, but we DON"T consider "Sorry I can only play on the weekends. I guess lets call a scheduling draw" reasonable effort. 2. Yellow cards for 24 hour rule violations are enforced only when moderators are made aware of such violations. We cannot monitor every single scheduling conversation. If you have issues scheduling/reaching your opponent please let the captains in the match know. You should expect an alternate search to be started to replace your opponent. Please send screenshots of your attempt to schedule with no response so we can enforce the rules. Captains, if its past 24 hours with no initial offers, set the player as unavailable for that week. Don't wait until mods get involved with threats of yellow cards and allow the poorly responsive player to play that week." Registration for Series season 3 is OPEN. Please join channel #series-general for more details. Registration ends on 3rd June 23:59 UTC. Season 3 starts on 11th June 00:00 UTC. Two videos by @quirked, covering the last review of Season 11 of the League and a live commentary of Season 12 games along with @somethingpretentious. 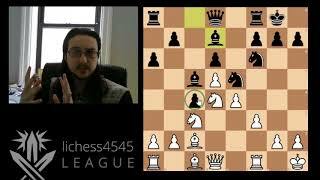 Plus extra analysis content with 3 quirked OTB games reviews (with one agaisnt IM Kassa Korley.) And one viewer game. The fastest mate was white on move 14 found in Gamelink White: scrubthatdish, Black: vevochi. The fastest draw was on move 22 found in Gamelink White: grunfeld-defense, Black: jughandle10. The fastest resign was black on move 11 found in Gamelink White: gokuba, Black: the_loving_boy. The biggest upset was 378 points in Gamelink White: michionov, Black: davbond. The longest game ended with white on move 94 Gamelink White: sangan, Black: morallygray. 196 was the highest ACPL in Gamelink White: emptyset2, Black: rodeo. 7 was the lowest ACPL in Gamelink White: roso97, Black: journey_to_nm. Combined maximum ACPL was 347 in Gamelink White: emptyset2, Black: rodeo. Combined minimum ACPL was 14 in Gamelink White: roso97, Black: journey_to_nm. The longest think was 22 minutes 38.0 seconds by 10 in Gamelink White: vagician, Black: s2004k1993. The most time left was 69 minutes 49.0 seconds in Gamelink White: ryen89, Black: acer30. The most time spent was 97 minutes 60.0 seconds in Gamelink White: sangan, Black: morallygray. The fastest mate was white on move 35 found in Gamelink White: supermaths, Black: liamvo. The fastest draw was on move 23 found in Gamelink White: outerheaven92, Black: toni4127. The fastest resign was black on move 10 found in Gamelink White: toni4127, Black: outerheaven92. The biggest upset was 115 points in Gamelink White: dose7781, Black: tnan123. The longest game ended with black on move 73 Gamelink White: tonychess75, Black: tnan123. 110 was the highest ACPL in Gamelink White: maurice95, Black: yago666. 8 was the lowest ACPL in Gamelink White: toni4127, Black: outerheaven92. Combined maximum ACPL was 198 in Gamelink White: maurice95, Black: yago666. Combined minimum ACPL was 33 in Gamelink White: outerheaven92, Black: toni4127. The longest think was 7 minutes 34.0 seconds by 15 in Gamelink White: mn8, Black: krispl. The most time left was 14 minutes 7.0 seconds in Gamelink White: supermaths, Black: liamvo. The most time spent was 26 minutes 42.0 seconds in Gamelink White: tonychess75, Black: tnan123. Shared by @yago666. "Black to play and draw."